Considering the long hours many people put in at work and the continual demands placed on them by family commitments upon eventually returning home, it’s little wonder why so many people are feeling the effects of stress. While most people are familiar with feeling on edge or frequently experiencing headaches and stomachaches as a result of stress, many people don’t know that stress can also have a negative impact on their oral health, as well. If you deal with stress, here are a few tips to help you deal with these oral health problems. A tiny ulcer with a white base and red border, canker sores form inside the mouth individually or in groups. While the exact cause of canker sores remains unknown, health experts do believe that stress, along with allergies and fatigue, can increase a person’s risk of developing them. Fortunately, canker sores are not contagious. Canker sores will heal on their own within a seven to 10 days. If you experience sensitivity and discomfort due to your canker sores, try using an over-the-counter anesthetics you can apply topically to the affected area. To reduce irritation, try to avoid eating highly acidic foods, spicy foods, or foods or drinks that are extremely hot. The cause of cold sores, occasionally referred to as fever blisters, don’t remain a mystery of science, as they are the result of herpes simplex virus, which is contagious. A fluid-filled blister, cold sores develop on and around the lips, but can also spread to the chin area and under the nose. As with canker sores, cold sores will generally heal within a 10-day period. However, in addition to over-the-counter topical remedies, you can also treat cold sores with antiviral drugs prescribed by a doctor. It’s important to begin treating a cold sore as soon as it begins to appear, so don’t delay seeking treatment. Clinically referred to a bruxism, teeth grinding is often an unconscious habit that results in excess pressure being placed on your teeth’s enamel. The extra strain causes your enamel to slowly wear down, exposing the delicate interior of your teeth, the dentin, to bacteria that causes decay and cavities. Individuals who already grind or clench their teeth may find the habit becomes worse when experiencing the effects of stress. 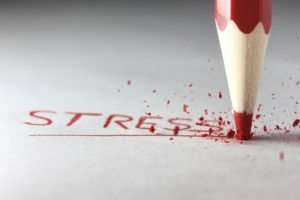 Individuals dealing with extreme levels of stress may find their mood affected, causing them to forego practicing daily oral hygiene habits such rinsing, flossing, and brushing. Failing to take care of your oral health will cause your teeth and gums to suffer. If you already deal with gingivitis, a mild form of gum disease, skipping brushing and flossing daily will allow the disease to progress into periodontitis, a more serious form of gum disease and the leading cause of tooth loss in adults. Individuals under stress also have a tendency to eat less healthy foods. Diets high in sugar, coupled with failing to brush and floss, can cause even more damage to a person’s oral health. If you deal with stress, try to remind yourself of the important role healthy eating and practicing quality oral hygiene plays in maintaining strong teeth and gums. 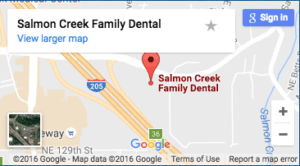 Contact the best emergency dentist Salmon creek has, Salmon Creek Family Dentistry.